This is the second part of the trip in the plane that I was lucky enough to take the other week. Many thanks again to Rod who made it possible. 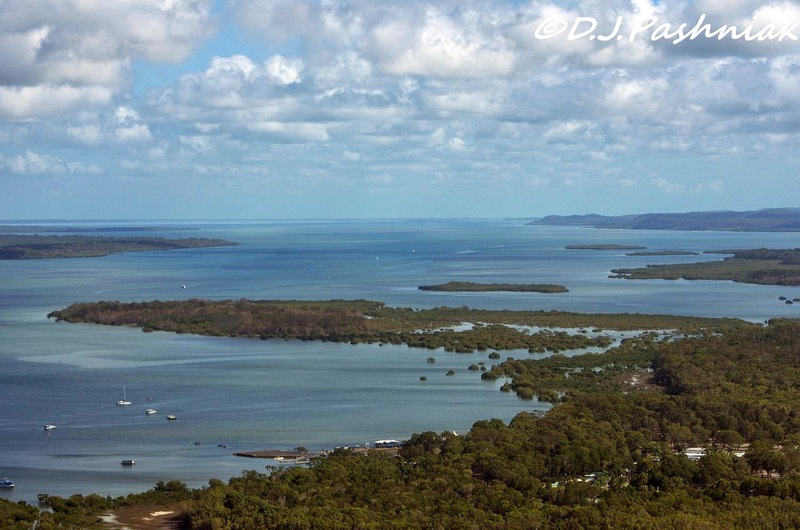 From Inskip Point we flew south along the Strait and then out to Rainbow Beach on the sea coast. 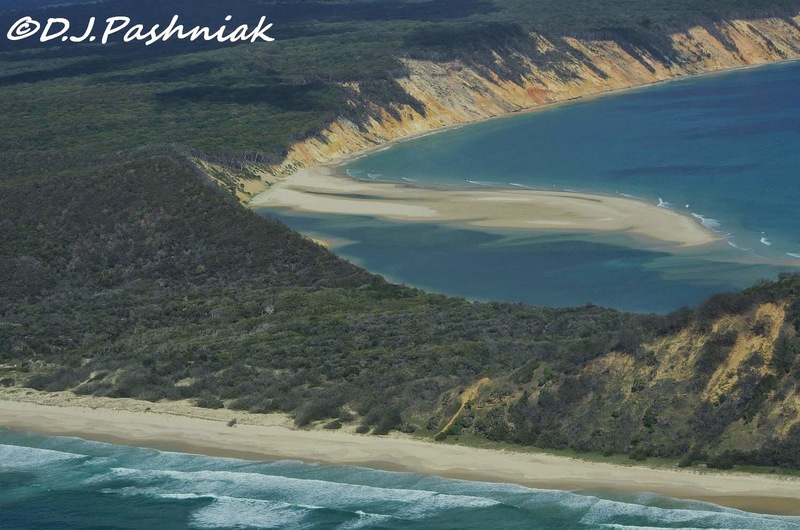 Part of Rainbow Beach is quite high above the sea and has spectacular views. Some of the best views are up on the sand blow where sand from the cliffs along the beach has blown up and is still moving inland. Further south we came to Double Island Point. On the north side of the point there are shallow lagoons where the water color contrasts with the deeper water just off shore. 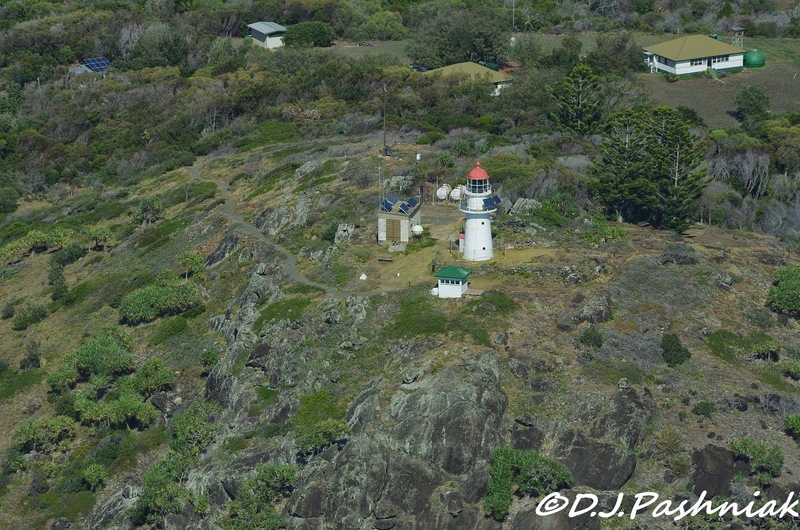 The light house at Double Island Point sits high on a rocky head-land. I hiked up to the light house last year with Sarah and Graham and told about it here. It was even more spectacular to see it from the air - and considerably less effort on my part too! 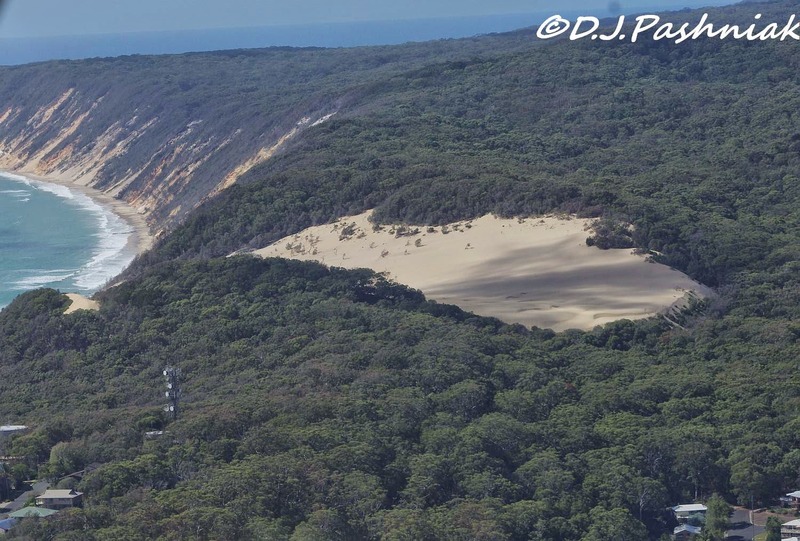 As we circled around the Point we could see the beach on the south side and the low land where 4 wheel drive vehicles drive over to the the northern side and the beach which goes back north towards Rainbow Beach. The colored sand cliffs look amazing against the dark blue color of the sea. 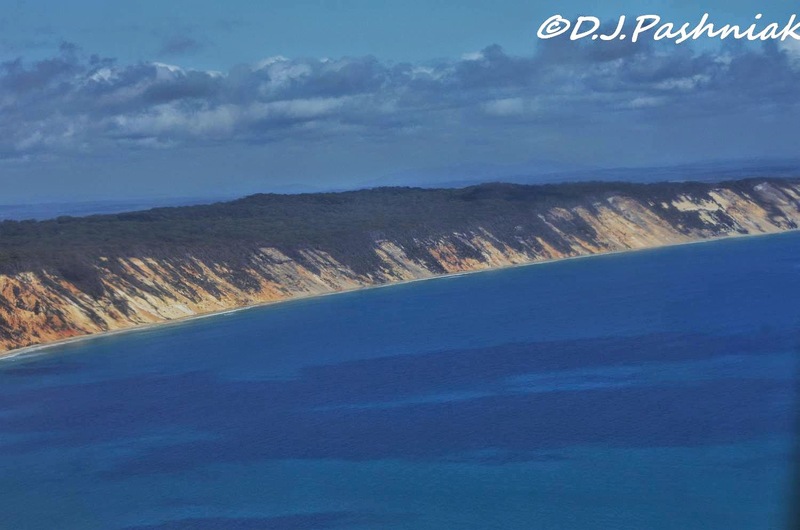 Behind the cliffs is part of the Great Sandy National Park. 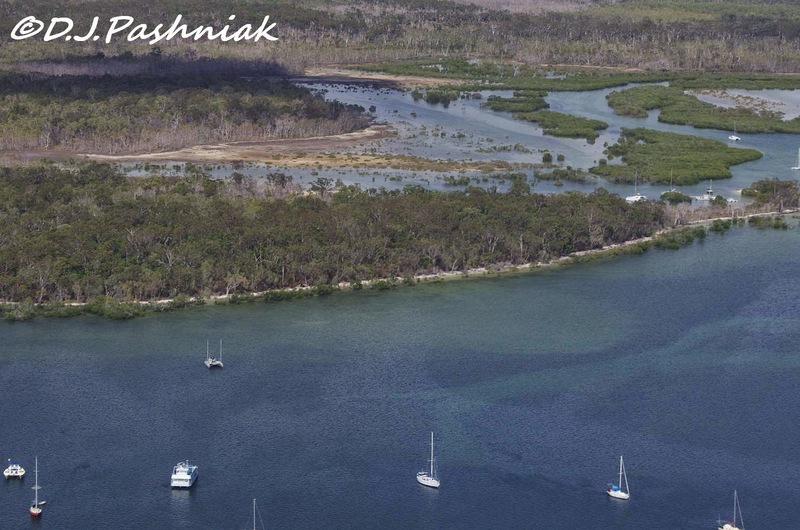 We flew back as far as Rainbow Beach then crossed the land to come out over Carlo Creek and the caravan park and boat launch. This is also an area where there are always some boats at anchor. It is a good sheltered area for when the bay gets very rough. On the southern end of Tin Can Bay town we flew past Crab Creek and I got good views down over the shorebird roost at that place. Shorebirds roost around the shallow sandy lagoon behind the mangroves that line the creek and the bay. 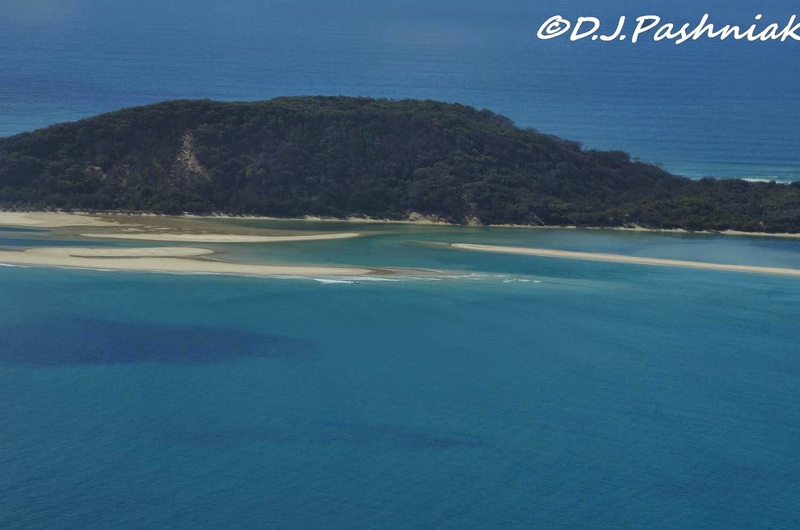 We flew on towards Cooloola Cove and the airport and as we flew in I had the best views I have ever had of what we call the Airport Roost. 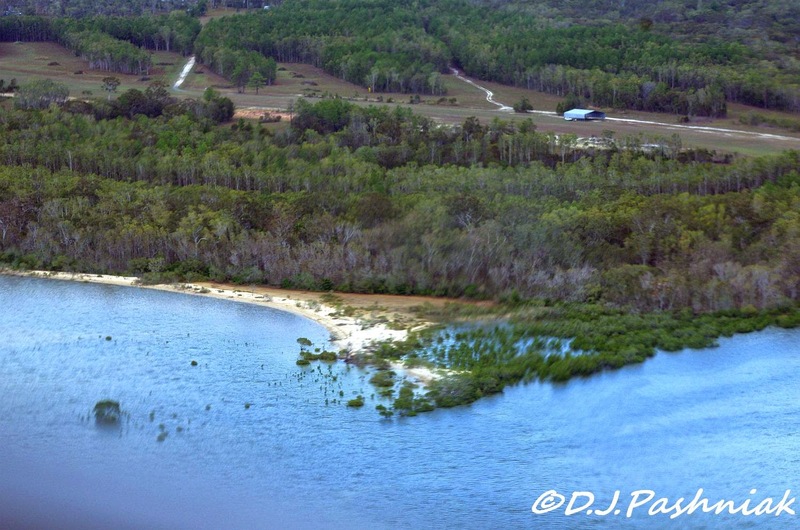 The birds roost on the strip of sand and also in the mangrove trees at the center bottom of the photo. There is also a glint of water in the lagoon behind the roost where mangrove trees are rapidly growing up and filling in the watery area. The hangar at the airport is the building visible towards the top right of the photo. It is this roost that I have been getting more bird counts and photos of over the last 12 months or so. Until now it has been rather neglected on counting days - there is just too much to count for only 4 people! I have seen over 30 Pacific Golden Plovers on this roost this season and right now they are going into their spectacular breeding plumage. None of them yet has a full black front and face and some of them have very little black at all. Thanks Therese - I am so lucky to live in a place like this! Beautiful Plovers and great to see all the photos taken from the air. Thanks Neil - I would really like to get at least one pic of a plover with FULL black breeding plumage! I don't think I have even seen one in full BP here - maybe like a lot of the other shorebirds they change some plumage on the way north??? Didn't think the aerial shots could possibly be better than what you showed us last time, but they just keep getting more beautiful.! I love the beautiful plovers. Thanks Sallie, glad you liked them. I agree with the others, I didn't think your aerial shots could get any better, but they do indeed keep getting more beautiful!! The captures of the plovers are fantastic!! What beautiful birds! Thanks for sharing, Mick!! Have a great week!! Hi Sylvia, I was hoping my readers wouldn't get tired of all my aerial photos but I guess not! Thanks for commenting. Hi Carol - I agree the scenery it beautiful but - for me - the birds make the area perfect! You only notice from the air the different shades of blue that is the sea. Those rainbow cliffs look spectacular. Hi Fun60 - even from the cliffs above the sea it is very hard to get the sea colors right. I've tried so many times!! Wow, gorgeous views and scenery from the plane. I love the lighthouse! The Golden Plovers are on my list of want to see birds. Wonderful post and photos. Have a happy week! Thanks for commenting Eileen. I enjoy photographing the Plovers and am glad I have finally found a place where I can get close enough for good photos without disturbing them too much. Of course, it's an access by water/kayak only place! Looks like a beautiful place you have moved to...am thinking of moving too - closer to nature. Great shots! Thanks for commenting Ladyfi - no wonder it is a favorite holiday destination. Spectacular scenery and not all white sand then? Could be a view or to over the rocky coast of Cornwall or Wales. 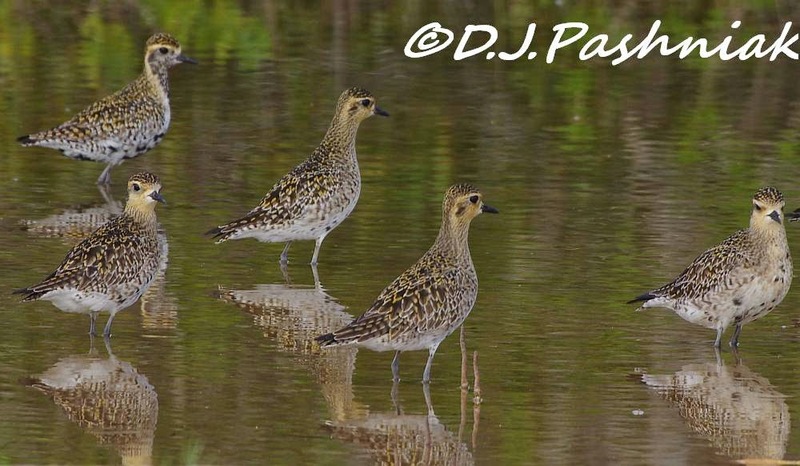 Fabulous shots of the Pacific Golden Plovers. Here our Golden Plovers are in a similar stage of plumage as they pass through still heading north. I'm so jealous; aa hundred yards or more is as close as I can get to Golden Plovers as they are incredibly wild and no chance of pictures like yours. Hi Phil, very interesting comparison to cliffs overlooking the sea in Great Britain. re the birds - I go out in my kayak on a very still morning and drift in with the tide and light wind. If I moved at all the birds would take off immediately. It usually takes ages to get in to where I want to go - but it is the only way to get close to the birds. Even the click of opening the catches on the waterproof camera box will set the whole flock off! Beautiful scenery Mick! I love the many shades of blue water. Great Plover shots, with terrific reflections! Thanks for your comment Karen. I like the changing colors of the sea too - that's one of the reasons I like living around here. What a great scenery! Amazing coastline! Gorgeous scenery. I love the shots of the plovers with the beautiful reflections. Thanks for your comment Gunilla. I liked the reflections too but the dark color of the water made really good and clear photos difficult. A stunning area and great birds. Amazing how the sand keeps moving inland. Your shots of the plovers and their reflections are delightful! Thanks for commenting, Carletta. Sand and wind behind it can make some amazing scenery and very interesting landforms. Such gorgeous views of the coastline. Breathtaking panoramas. especially love the view of the rocky headland. And the birds look wonderful as they "admire" their reflections. Thanks for your comments Gemma. 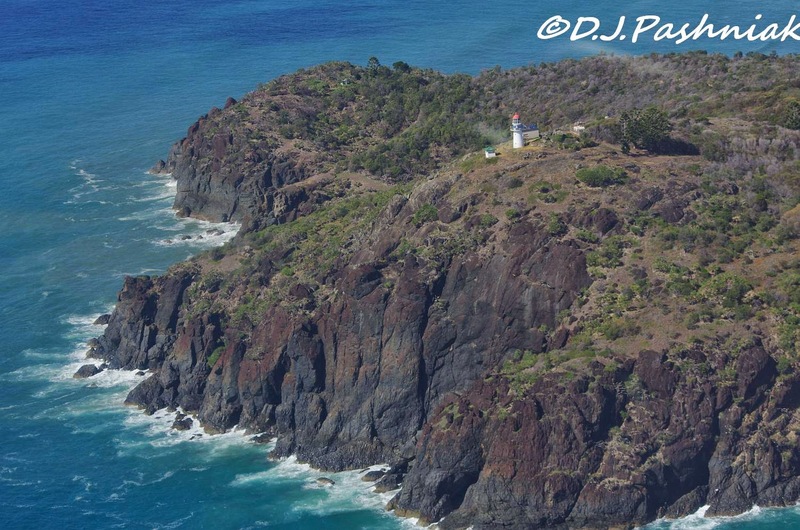 The rocky headland looks great from up in the air and from close down it has all sorts of little inlets in the sea at the base. HI Mick Spectacular scenery adn the shots of the Golden Plovers are fantastic, also their reflections. Thanks for commenting Margaret. I wonder if those plovers knew how good they blended with the brown water that morning. It had rained and the water was stained with rain water. Wonderful looking patch - only out done by the plovers! Beautiful area! The plovers are amazing! Spectacular! The birds in particular. I wanna see these guys! Thanks for your comments Stewart, Roan, and Pete. It seems that those Plovers made quite a hit this week! Such magnificent photos. How wonderful to capture it from the air. Wonderful photos and post. The golden pacific plovers are pretty. What beautiful aerial shots. The terrain surrounding that lighthouse looks pretty wild and rugged. 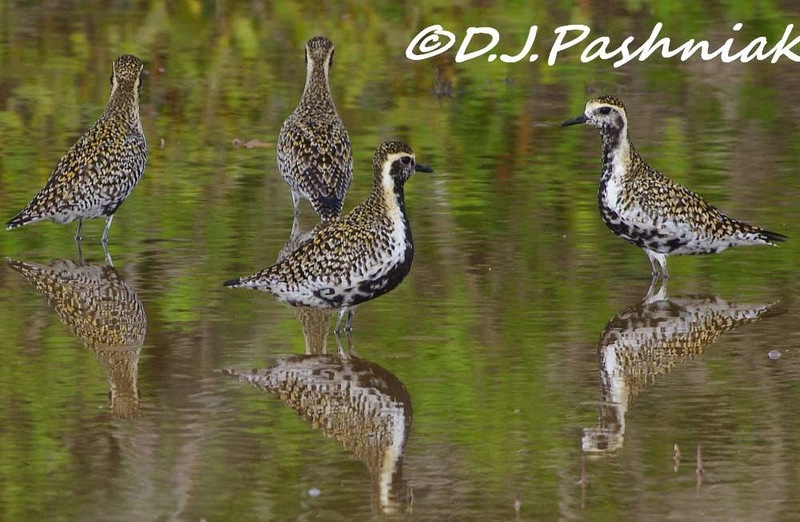 Your captures of the Golden Plovers and their reflections couldn't be more beautiful. Gorgeous photos! And the bird reflections are breathtaking! So pleased to see more of your aerial views, they're so wonderful, and so different to see areas I'm aware of or have been to from an air view. 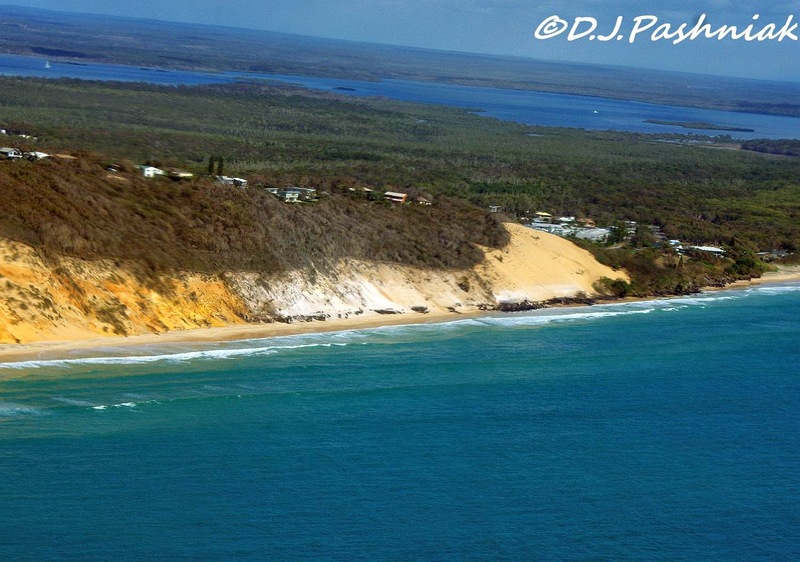 The cliff sands of Rainbow Beach's beautiful colours I can far more appreciate from your photo. The image of the Sand Blow is interesting. The winds must be quite constant and strong to have the sand rise up and over onto the land. The way the sand is along the cliff feels like it's moving, edging it's way up. Something I feel not sensed from ground level. Aussie waters might be full of stinging jelly fish, stonefish, sharks, and other risks, but how difficult it would be to resist feeling being immersed in waters of such luscious colours... though maybe being a lagoon could be safer to be able to indulge in. Seeing the South side from the air gives me the impression I could trek to one side to experience the calm waters, or the other to enjoy the sound and movement of the waves. A beautiful boundary view for the Great Sandy National Park. Oh I do so hope these beautiful areas you are showing stay safe. Your photos show exquisite scenes. The Carlo Creek area looks hardly inhabited from the air. With those beautiful clouds the scene is truly blissful, a place worth going with a caravan. Am not surprised the shorebirds like the Crab Creek area. They'd see that view themselves to know it's a good place to be. But for the bird photographer on land, wellies and lots of insect repellent would be needed I'm sure. Carlo and Crab Creek would be challenged during cyclonic times I presume. They look so flat from the air. Seems it wouldn't take a lot for the water to cover the land. As you mentioned though, they are sheltered from strong weather, I suppose that would be like Hervey Bay is sheltered by Fraser Island. An airport retaining natural landscape either side, that's rather special. Birds are truly astonishing... regardless of the noise of aircraft, they are quite comfortable roosting nearby, simply because the area they've chosen suits them. Are the mangroves refilling the watery area a good thing, or is it something that is kept in check for the birds? Bird Counting, what a challenging task. I admire you for doing so, it would be daunting to achieve. Pacific Golden Plovers have beautiful markings. When in their full breeding plumage they would be very stunning to see. The photos you've done of them are truly gorgeous. You do really lovely bird photos. The birds also seem to be aware of you, and not mind you being there at all, even if you are a distance away. I've very much enjoyed this Post, thank you. I tried to be less wordy this time, but it was difficult. Each of the photos you've shared have something of their own I've appreciated. Appreciate your visit to my Spangles Post too, thank you. Hi Magda. Ouch! I just hit the wrong button and my reply to you disappeared! Glad you liked the photos and my post. This is an amazing area and you certainly get a different view of it from in the air. You mentioned the water a couple of times - I love the water and usually manage a quick dip at the end of any bird count or bird photography session. I even had a surf on the south side of Double Island Point when I was down there last year with friends and my son (post Oct8 of last year). I don't surf enough now but felt safe with a couple of big males to get me out of trouble if necessary - haha! I was out counting and photographing shorebirds last Friday but unfortunately did not put on enough repellant and sandflys were particularly bad after the recent rain. That is the one drawbacks to the bay area. There are only a few shorebirds that roost in mangroves - the rest like more open sand where they can see around them. The airport roost so far has a pretty good mix of habitat and the area where the mangroves are growing up is not an area the birds use. Another splendid travelogue, Mick! Beautiful shorelines, beaches, water, mangroves, birds - I'm ready to pack up! Brilliant images of the Plovers! The changing water color makes me think the fishing there must be good. Have a great weekend! I'm off to search for a new friend with a pilot's license! Hi Wally - it would be great if I could find lots more friends that could facilitate all my best dreams for my hobbies! I am not a fisher person but there are always people fishing from the beach somewhere - and in the bay and the Strait lots of smaller boats with rods and lines hanging out from them! I think the best fishing however, is from further out and there are a number of charter companies that start out from Carlo and go a good way off shore. They always seem to come back with very happy customers and LOTS of fish! Anyone who came here right now would need to come equipped with lots of insect repellent - I practically got "carried away" yesterday!!! That really is a lovely stretch of coast line. You live in a wonderful part of the world. Golden Plovers are a lovely bird, we get the Eurasian species on my local moorland this time of year for breeding. Such spectacular views of the landscape, and I love those plovers! What a wonderful way to see the whole area! How blessed are you! We were hoping to head back up that way a little later in the year. I wish we had a 4WD as it would make a lot more of the area accessible to us to explore. 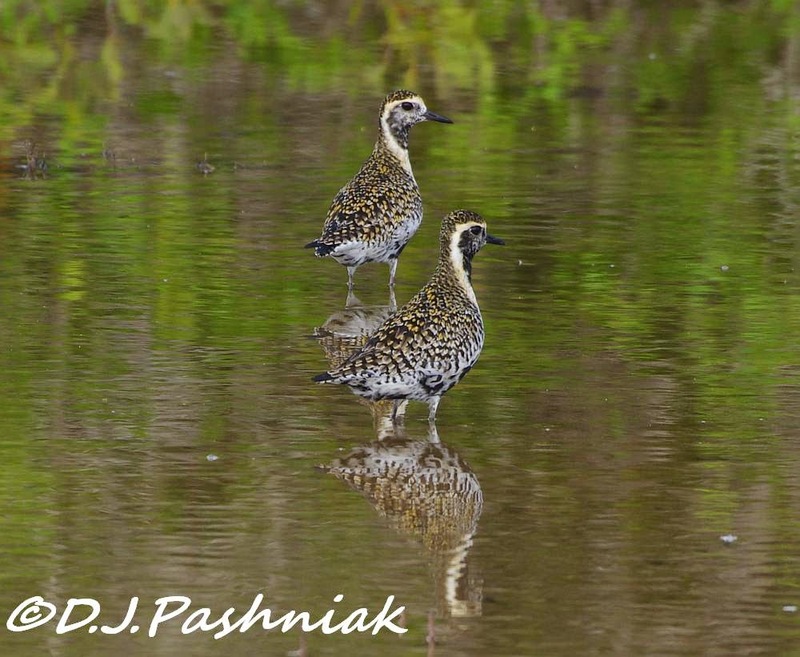 Beautiful landscapes and gorgeous images of the Pacific Golden Plovers. What a different perspective of the places around you! I'm excited for you that you got to see it from above :) Lovely shots, especially that lighthouse.